By definition, craft beverages are small-batch drinks and owned independently — but in some cases, the firms that make them eventually flourish and become so successful that they’re considered bigger brands. In fact, some are calling for bigger craft beer brands like Samuel Adams to stop calling themselves “craft”. However, just as these requests are growing, more craft beverages are coming to market, and from craft soda to wine, the list continues to grow. The rules and terminology specifications for craft beverages can sometimes add to the confusion rather than solving it, making the craft beverage question a complex one. In addition, to be referred to as a craft brewer, less than 25% percent of the craft brewery should be owned or controlled by a firm that isn’t considered a craft brewer. “So if ‘BigBeerCo,’ who makes 300 million barrels a year, buys part of ‘LittleMinnowBeerCo’, LittleMinnow can still be considered craft as long as BigBeer doesn’t own more than 24.9%,” Sluiter says. Can big firms not make “craft” quality? 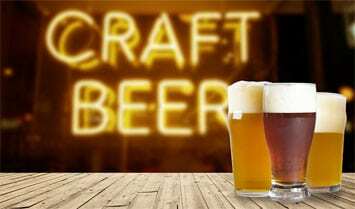 Although craft beer is defined as a beverage made by a smaller company, some bigger brewers have expressed frustration that the term “craft” inappropriately suggests that only smaller firms can make craft-style beer, when in reality, big brewers argue that their beer can have just as much artisan quality as smaller companies. So is “craft brewing” just a marketing term, or is it actually a technical description in the brewing industry? Despite the proliferation of craft brewers, small beverage firms can still stand out among the growing competition if they highlight the quality of their brews, Sluiter says. As the market narrows, existing brewers should focus strongly on branding, rebranding and ensuring that their finances are in order. Brewers should also maximise community engagement and grassroots marketing to stand out from the crowd, Sluiter says. In addition, craft brewers can innovate swiftly — something that bigger companies have a harder time doing, he adds, making it easier to stay ahead of the curve and bring new varieties to the marketplace.